Thanks to Rachel who sent this postcard showing the painted gable end at Free Derry Corner in Bogside, Derry, Northern Ireland. The site commemorates Free Derry, a self-declared autonomous nationalist area of Derry that existed between 1969 and 1972. 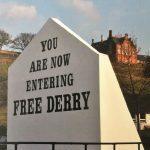 The nearby Free Derry Museum tells the story, including the civil rights era, Battle of the Bogside, Internment, Bloody Sunday and Operation Motorman.